Long a thoroughfare from East to West, crisscrossed with horses, wagons, rail, and highway, Wyoming is equally a magnet for outdoor sports. 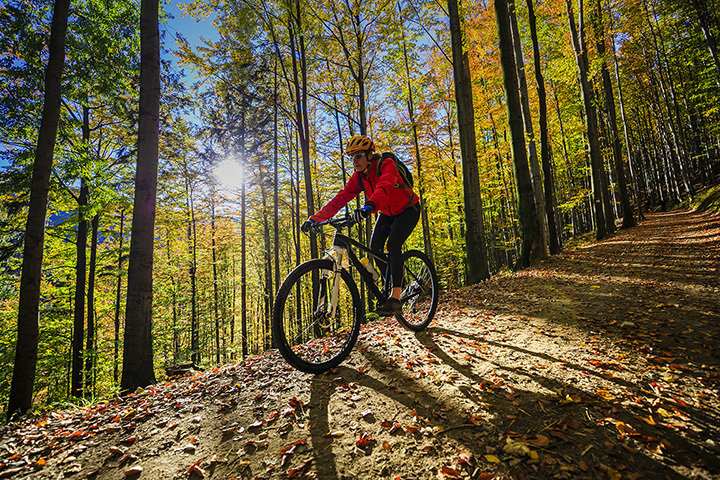 Among myriad options, cycling and mountain biking are especially popular, and perhaps surprisingly, it doesn’t matter the season. Bicycle culture has entwined itself into Wyoming history, be it the Laramie Club of the late 1800s to the TransAmerica Trail a century later. And today is no different: from resorts to small storefronts, rides & repair are always a short pedal away. To get a new set of wheels or some repairs on an old set, check out the 10 best bike shops in Wyoming. The name is supremely appropriate: This is the hub for cyclists. While perfectly accommodating to hobbyists and once-a-year vacationers, this bike shop is catered towards the pro, in all its best connotations. While not trying too hard, or attempting to appeal solely to hip trends, The Hub has all the essentials: that is, passionate experts with experience, the right parts & tools. Owner Aaron Grutzmacher brings years of experience in European bike shops, focusing on individualized, quality service worthy of a higher-than-larger-competitors’ price. Our demo fleet is getting dialed! @ibiscycles is in town tomorrow from 2pm till 6pm, come try an Ibis out! Laramie’s top bike shop for sales, repairs and parts, the Pedal House has been around since around 1990. This area of Wyoming is renowned for the history of the “Laramie Wheelmen,” of which Thomas Stevens was a part (he was the first person to bike across the U.S., and the world). This impassioned lineage bleeds into the Pedal House’s acumen and enthusiasm. And the icing on the cake: this expertise is balanced with a laid back, tongue-in-cheek attitude. The Bike & Trike website makes a compelling, and oft overlooked, point. A properly-fitted and assembled bike requires an attentive and experienced hand. The structural, let alone performance, standards of even a weekend cruiser necessitate care and know-how. This shop takes this customized approach seriously, serving up friendly service and nearly anything a cyclist requires, from street & BMX bikes to tires and tools. For the beautifully-rugged Wyoming southwest, there’s no better. A short drive west from Jackson, the Teton Pass area is a singular wilderness, home to inimitable terrain and miles of cycling nirvana. Rising to the occasion with well-trained staff that practice what they preach (and repair), Wilson Backcountry has done this demanding outdoor clientele proud for nearly 25 years. Fully equipped to handle any maintenance and repair needs, this shop also sports an extensive rental and demo menu. Whether a street bike for a springtime ride, or a fully decked-out mountain bike, a 24-hour rental allows for tourists and locals alike to sample both the long list of bicycle brands, and the winding miles of potential Teton terrain. It’s no secret: It’s hard to compete with the seemingly endless resources and marketing of a world-renowned ski resort. (This, is of course, a testament to the quality of local cycling operations.) But that said, Grand Targhee makes full use of its amenities, offering any style bike for any style occasion. Repairs, maintenance, demos, sales, rentals and everything in between can be found mountainside. Depending on one’s intended cycling adventure, resort prices range from $35-$100 a day, with deals for kids, families, and longer-term sessions. It’s not surprising that the town named for famed Western showman and popularizer, Buffalo Bill, also has some pristine wilderness. And these natural assets provide ideal terrain for adventurous outdoor enthusiasts, cycling certainly among them. Founded with contagious passion and an authentic cycle-centric focus (Joyvagen = “path to happiness”), this shop melds small-town hospitality & unpretentiousness with sophisticated expertise & inventory. If a cyclist is anywhere near Cody, there’s no better shop for the three R’s: repair, rent, ride. For 15 years, Hoff’s has provided top-notch service and sales for all things bike. Whether getting a jersey, buying some saddle bags for a cross-state trek, or buying a new or used customizable bicycle, the experts here are happy to help. From imported, futuristic do-everything’s to a local-enthusiast’s labor of love, any sort of bike is on offer here. And if the selection is too overwhelming, and the knowledgeable staff can’t narrow it down, the rental program is the perfect option: flexible, well-stocked and affordable (around $50 per day). In the winter, they’re all about ski. But anytime else, Rock On Wheels embodies the local bike shop (it started as a literal one-man operation). No frills, with a plethora of rides simply hung from the walls and ceiling, a la a taxdermied Tour de France, experts and newbies are welcome. Approachable and experienced, the staff are happy to accommodate any customization, repair or sales request, and for the inexperienced or indecisive, they’re more than happy to make recommendations. For 15 years, this neighborhood pro shop has beyond passed muster. And it’s no stretch to expect another successful decade and a half. There’s actually some Irish in the Teton Valley, and it’s charmingly evident at Fitzgerald’s (after all, it was opened on St. Patrick’s Day). Starting on the other side of Teton Pass fifteen years ago, the Jackson incarnation of this repair, apparel, maintenance, sales and rental oasis represents another strong link the surprisingly-long chain of Wyoming bicycle culture. A four-time winner of Best Bike Shop in Jackson, and frequenting the top-100 nationwide, this shop’s success isn’t only in its impressive inventory and well-versed staff: it’s also a result of the core principles of being kind, respecting the environment and, most of all, having fun! A renowned peak to geologists, mountaineers and sportsman alike, the ruggedness and incomparable natural bounty of Gannett Peak and its environs begs to be conquered by two-wheels (or, far more likely, at least ridden upon). The mountains here attract climbers seeking to face their acclaimed difficulty, or naturalists admiring their being a Rocky Mountain cornerstone of sorts. And cyclists can certainly relate. A self-described “service-centered gear shop,” this shop of friendly experts happily rises to the occasion of such a demanding environment. It’s no wonder, they’ve won awards.